This recipe is adapted from Mira Sacerdoti's cookbook Italian Jewish Cooking; she suggests it be served at Passover, and introduces it with, "given the time necessary to prepare this and its splendid appearance, this is a classic holiday dish." "To cool the meatloaf under pressure, put it in a fairly deep, flat-bottomed dish, cover it with another plate (upside down) and put a weight on it. My mother-in-law used a large iron, but I prefer to use two 1 1/2-pound cans." This is an elaborate, impressive special-occasion dish that will serve a crowd. You make the broth 2 days before serving, and chill it overnight 1 day before serving, so that on the day of your big dinner, all you need to do is let it come to room temperature and serve – you can also reheat it, if desired. To prepare this recipe, you'll need a needle and thread. 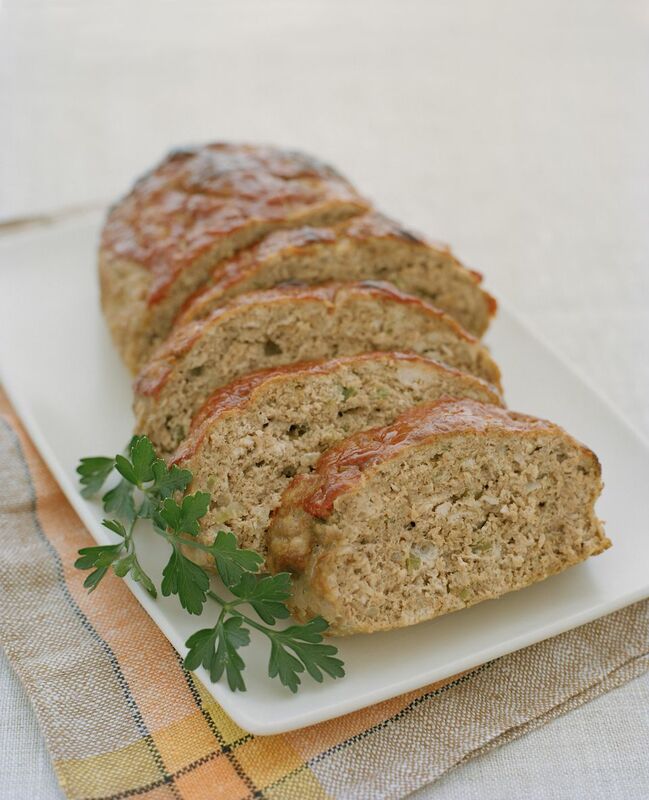 Note: while there are multiple steps to this recipe, this meatloaf is broken down into workable categories to help you better plan for preparation and cooking. Begin one day ahead of time by making the broth: Skin the turkey breast, taking care not to tear the skin, then bone it, again being careful to keep the meat in one piece. In a large pot, cover the turkey and beef bones, together with the carrot, parsley, onion, and celery with enough water to cover (about 1 1/2-2 quarts). Bring to a simmer and simmer for about 2 hours, or until rich and flavorful. Once the broth is done, strain it, let it cool to room temperature, and refrigerate overnight. Take the turkey breast and cut it lengthwise into finger-thick slices. Do the same with the veal. Cut the chicken or turkey fat into finer slices. Thread your needle. Take the turkey skin and spread it out on your work surface with the inside facing up, being careful not to tear it—to reduce the risk of subsequent tearing, lay it on top of a sheet of linen or muslin. Gently spread the garlic over the skin. Lay alternating slices of meat across one half the turkey skin, leaving a border of 3/4-inch/2 cm, interspersing them with the fat and sprinkling the layers with the nuts, and seasoning lightly with salt and pepper. Occasionally try folding over the other half of the skin and stop when the skin is full —you don't want to overpack it because it could burst in the cooking. If you have leftover meat, set it aside for another dish. Once you have added all the meat that will fit, sew up the skin with your needle and thread, spacing the stitches closely and being careful not to pull the thread too hard and thus tear the skin. When you are done, puncture the skin of the loaf repeatedly with a slightly larger needle so it won't burst as it cooks. If you have, put a sheet of muslin under the turkey, pull it around the loaf and tie it tight. Put the loaf in the refrigerator, and let it sit overnight along with the broth. The next day, skim away the fat that has risen to the surface of the broth, and if it the soup has gelled, warm it gently to a simmer. Slip the turkey loaf into the broth and let it simmer for 2 hours. When it's cooked, remove the meatloaf from the pot (save the broth for soup), let it cool, unwrap it if you have wrapped it, and transfer it to the flat-bottomed deep dish. Weight it down and chill it thoroughly—overnight would be ideal. The next day, carefully turn the meatloaf out onto a cutting board. The skin will be very delicate—remove any traces of broth or fat, and slice it into 1/2-inch/1 cm thick slices. Arrange the slices on a platter, and garnish with sprigs of parsley. If you'd rather not serve it at room temperature, you may gently reheat it in a microwave or a low oven.